Looking for a Quality Nail Technician or Nail Salon? 1) Does the technician offer a consultation? A consultation entails a conversation to evaluate your nails and further discuss your needs and preferences. Are they asking about your lifestyle, occupation and medical history as these play a big part in how your enhancements will last. Just because your best friend rocks 3 inch stiletto nails, doesn’t mean that you should be. 2) Is the nail technician licensed in the state where they are practicing? Is there a license present? Most states require a nail technician to attend a beauty school, clock so many hours and pass the state licensing exam. Here in Arizona, techs must clock 600 hours of a combination of practical and classroom time and pass the state licensing exam from the Arizona State Board of Cosmetology (AZBOC). Once a license has been obtained, it requires renewal every year. According to AZBOC, licenses must be posted at the technician’s station. 3) How do they disinfect their pedicure chairs? There are many salons who offer the luxury of a whirlpool pedicure spas, however the question remains how are they cleaning the spas and how often? Getting a safe pedicure is important and your health depends on it. As a result of a poorly disinfected pedicure spa, people have become sickly with bacterial skin infections due to fungus, staph, and MRSA ending in medication, surgery and in a few instances death. Below you will find a standard protocol for cleaning any type of pedicure spa. It does not matter if it is a whirlpool, pipe-less, air-jetted or circulating spa, the protocols are the same according to the EPA and the most state boards of cosmetology across the country. After each client, the spa needs to be drained of debris and cleaned with soapy water. This is usually where it ends, but where the most important step should begin. The chair needs to be disinfected with a hospital grade EPA registered disinfectant, this means the disinfectant needs to be circulating in the spa for a minimum of 10 minutes (most manufacturer recommendations). At the end of the day, filters, screens, and removable parts needs to be removed and scrubbed, rinsed, and replaced. The spa must be filled again with disinfectant and water and circulate for another 10 minutes. The alternative to a pedicure spa is a foot bath that contains no whirlpool or jets, and most still offer a liner for a more protected pedicure. 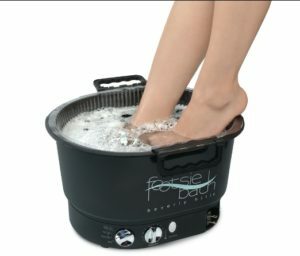 At Addicted to Nails, we did just that; we ditched the pedicure spa and invested in a Footsie Foot Bath with disposable liners for your protection. A great pedicure is not created by what you are soaking your feet in. A great pedicure is created by a skilled technician using effective and safe products and techniques. 4) What is their nail enhancement removal process? There are many ways to remove nail enhancements, however PRYING them off your nail bed with a plastic nail tip, acrylic/cuticle nippers, dental floss, and so forth. Some of the newer hard gels on the market can be soaked off in acetone/product remover otherwise they need to be filed off using safe techniques without creating damage to the natural nail. Acrylic nails need to be soaked off in acetone/product remover, and filed sporadically. If the salon you were going to uses an MMA liquid, soaking off your enhancements may be time consuming, which makes sense why some techs are looking for quick methods regardless of damage. Addicted to Nails uses SonicTouch Ultrasonic Remover, its effective because of the combination of ultra-sonic waves and heat to safely, and can dissolve full enhancements in about 20 minutes without any damage to the natural nail. 5) How do they sanitize and disinfect their implements, files and buffers? This topic requires me to stand on a soap box, according to the Arizona State Board of Cosmetology tools and implements must be washed with and completely immersed in an Hospital EPA disinfectant based on manufacturer’s instructions for a minimum of 10 minutes. There are other supplies that come into direct contact with the client that cannot be disinfected like cotton, porous nail files and buffers, sanding bands for e-files, toe separators, pedi slippers, orange wood sticks, etc. must disposed in the garbage immediately after use. 6) What about those UV Sterilization pouches for implements? 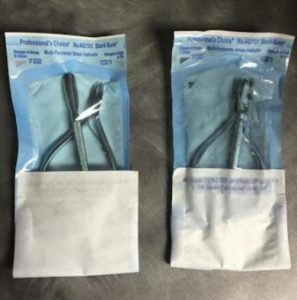 Let’s get the facts straight about these pouches….they are to be used to sterilize implements in an AUTOCLAVE, not a UV sterilizer (note, most towel warmers also look or are labeled UV Sterilizer). Let me give you the dirty on how many salons are scamming you into thinking you are getting sterilized implements. So what does an autoclave do? An autoclave creates high pressure steam at 249 degrees for 15-20 minutes to destroy of any kind of bacteria, virus, fungi or spore. When the pouch, comes out of an autoclave it just went through the ringer, it will look wet, water stained and wrinkled. Depending on the brand of pouch, they have a symbol, letter or strip that changes color indicate that proper temperature were reached and the implements are sterilized. Unless they autoclave, there is no reason to use a pouch, period. If your tech sits down and the pouch looks unused, clean and like a new envelope of implements, I would question their disinfection/sterilization procedures. There are 3 states (Iowa, New York and Texas)that have made the use of autoclave law for sterilization of implements. In the state of Arizona, tools and implements must be washed with and submerged in an Hospital grade EPA disinfectant based on manufacturer’s instructions for a minimum of 10 minutes. 7) Does your nail technician use professional only products? I hear many clients tell me that there last salon used lots of labeled containers and they never really knew the name or product that was being applied to their skin and nails. This is concerning, what if you were to have a reaction to a product and needed to seek medical treatment. Your nail tech should be happy to elaborate on the brand or product that is being used and their functions. At Addicted to Nails, we take pride in the professional products we use and are happy to explain the brand and what each product is used for. We never thin out polishes, or transfer products into unlabeled containers. 8) Does the nail (liquid) being used contain MMA (Methyl Methacrylate) when creating acrylic nails? I know that’s a big word, but if you have ever wondered by some salons can charge $20 for a full set and $13 for a fill and other salons charge in upwards of $50-75 for a full set there is a good reason for that. Have you ever walked by a discount salon and smell a sweet yet noxious odor? There is a good chance they are using nail liquid that contains MMA (see my blog post about gel versus acrylic for more information on MMA). Although the Arizona State Board of Cosmetology (and most states in the U.S.) prohibit the use of these products containing hazardous substances banned by the The Food and Drug Administration (FDA) such as MMA being used in salon, many salons continue to use substandard product putting you at risk of adverse reaction, such as redness, swelling, and pain in the nail bed. 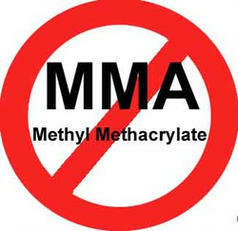 At Addicted to Nails, we are 100% against the use of MMA and only use professional grade EMA (Ethyl Methacrylate) monomers. 9) Do they using a professional electric file? Let’s get the story straight, e-files do not damages your nails! An unskilled nail technician using an e-file damages your nails, period. Although both maybe be rotary tools, there is a difference in a professional e-file (usually costing $400+) and a dremel tool which can be purchased at a home improvement store for around $38 bucks. The bits created to prep, refine and smooth enhancements are smaller and usually created in ceramic, diamond coated or carbide, all that can be submerged in disinfectant. In saying all of that, many nail techs choose to use sanding bands for preparation or refinement of their enhancement. Be sure that the sanding band your tech is using is NEW, meaning there is soiled white dust on the band itself. Sanding bands cannot be disinfected and must be thrown away after each client, there are no exceptions. 10) Do they take continuing education and attend trade shows after obtaining their license? Continuing education is absolutely an important key of being a successful nail technician. Attending classes and trade shows not only educates techs on product knowledge and effective application and safe techniques but also replenishes their passion for their trade. Most professional nail brands offer continuing education classes on their products, once completed techs are given a certificate to show they successfully taken the course. Many people look at nail services as a luxury and although its always fun to pampered, however it also essential that you choose a salon/ tech that takes their business seriously. An educated and skilled nail technician should be happy to answer any question you may have. If the service seems unsafe, ask questions and/or excuse yourself from the service.